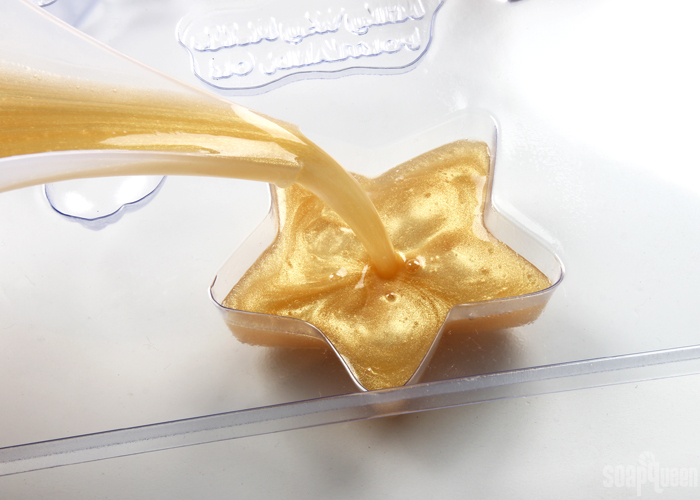 ONE: Chop and melt 18 ounces of Clear Melt and Pour Soap in the microwave using 30 second bursts. 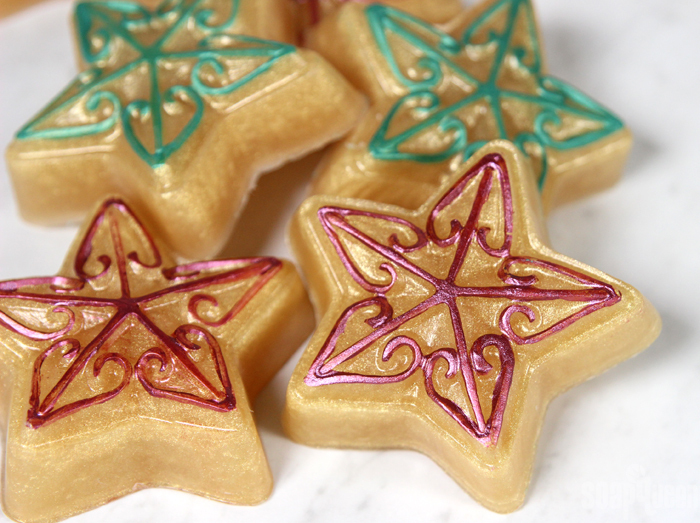 Once melted, add shavings of the Shimmer Sparkle Gold Color Block and fully mix in. Continue adding color until you have a sparkly gold color. 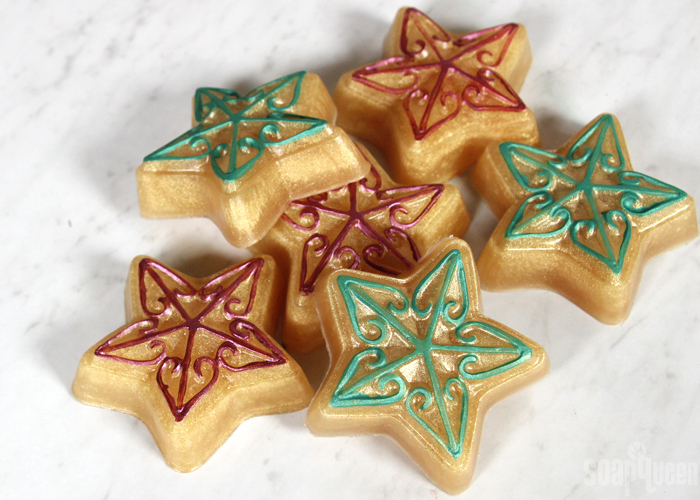 TWO: Add 0.1 ounce of Sleigh Ride Fragrance Oil and 0.1 ounce of Vanilla Color Stabilizer to the soap. Use a spoon to fully mix in. 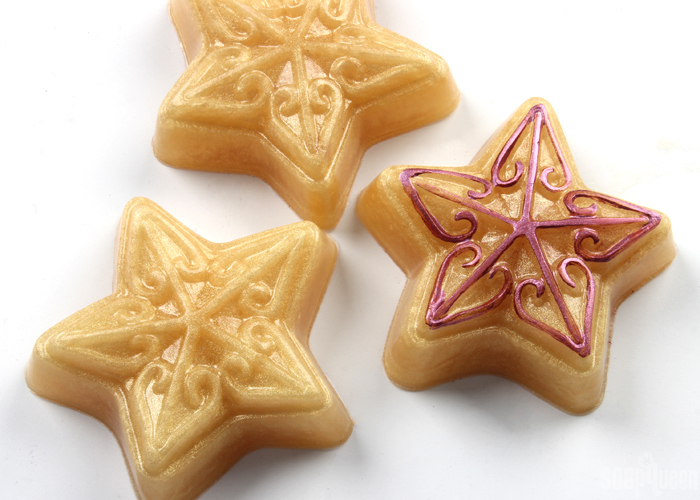 THREE: Pour the soap into each mold cavity, and spritz with 99% isopropyl alcohol to get rid of bubbles. FOUR: Once the soaps have fully cooled and hardened (about 2-3 hours) remove from the mold. In separate containers, mix together about 1/2 Tbs. rubbing alcohol with 1/2 tsp. Merlot Sparkle Mica and Shamrock Green Mica. 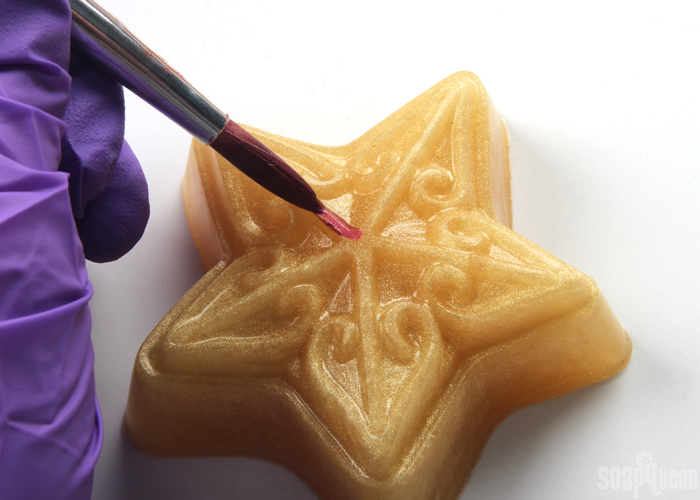 The “paint” should be thin enough to paint, but saturated enough to leave distinct color on the soap. 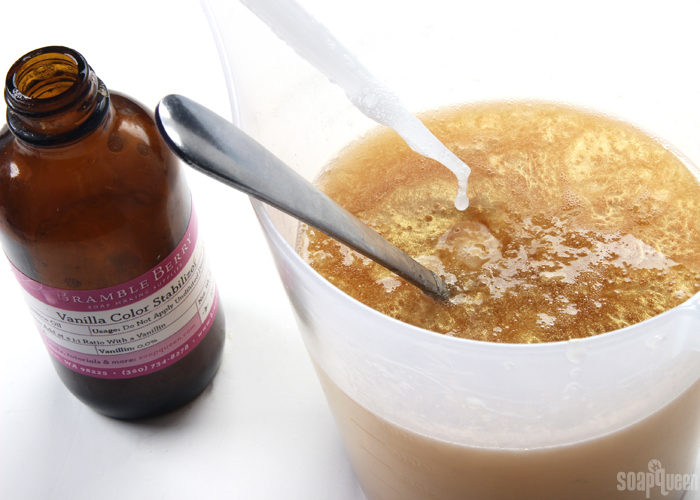 Add more colorant or alcohol if necessary. FIVE: Use a small paint brush to paint the mica on the details. Allow to fully dry. Repeat the process with the Shamrock Green Mica. Once the mica is completely dry, spritz the top of the soap with aerosol hairspray. Just a few sprays does the trick! The hairspray helps seal the mica, making it a little more durable to the touch. It may still transfer slightly. 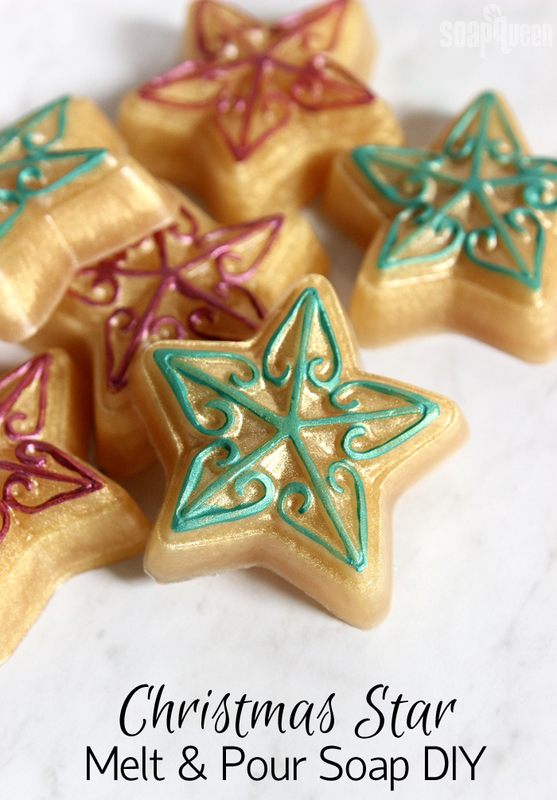 These Christmas star soaps are perfect for the holidays! Chop and melt 18 ounces of Clear Melt and Pour Soap in the microwave using 30 second bursts. 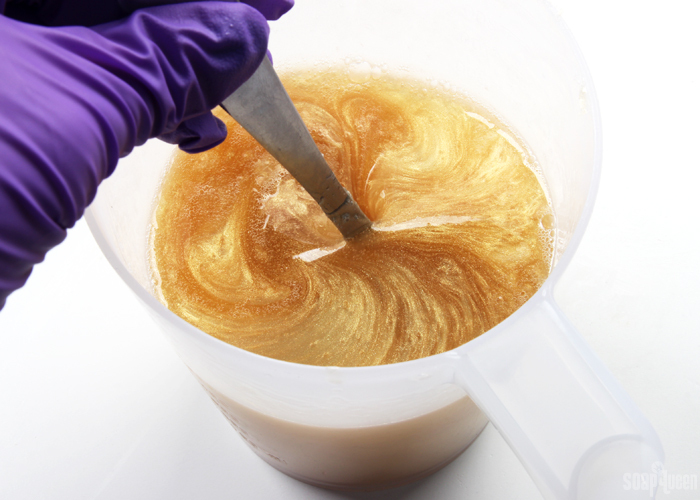 Once melted, add shavings of the Shimmer Sparkle Gold Color Block and fully mix in. Continue adding color until you have a sparkly gold color. 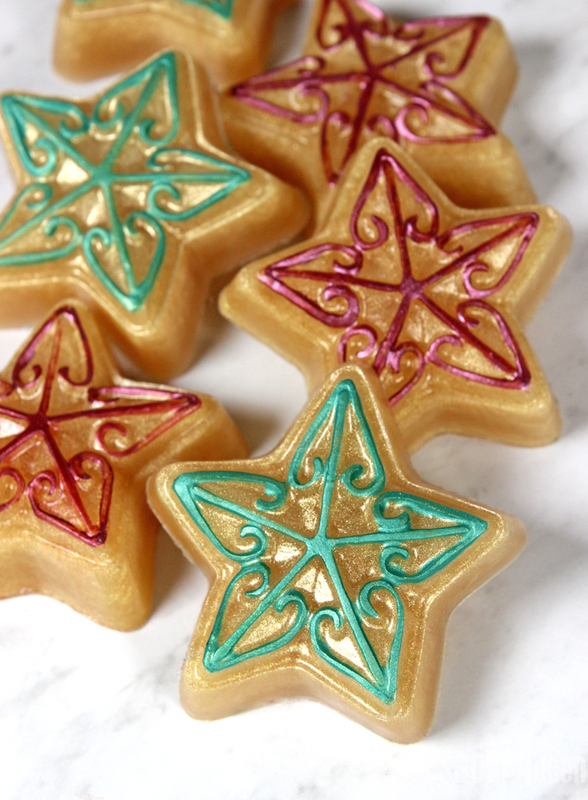 Add 0.1 ounce of Sleigh Ride Fragrance Oil and 0.1 ounce of Vanilla Color Stabilizer to the soap. Use a spoon to fully mix in. Once the soaps have fully cooled and hardened (about 2-3 hours) remove from the mold. In small separate containers, mix together about ½ Tbs. rubbing alcohol with ½ tsp. Merlot Sparkle Mica. 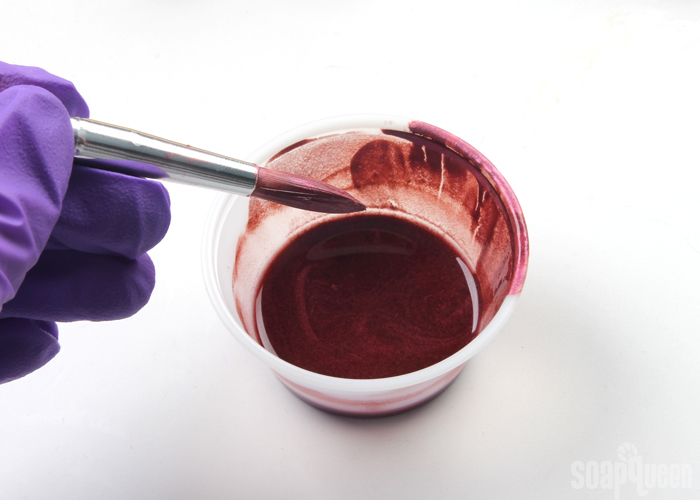 The “paint” should be thin enough to paint, but saturated enough to leave distinct color on the soap. Use a small paint brush to paint the mica on the details. Allow to fully dry. Repeat the process with the Shamrock Green Mica. Once the mica paint has completely dried, spray the soap with unscented aerosol hairspray. Just a quick spray does the trick! Hmm..following the directions to the letter, but ending up with soaps that stain the hands with the “paint” color. Ideas? The paint color is already so faint, but my test soaps have managed to turn our hands green and red! I’d hate to give these as gifts and stain someone’s hands or towels. Ideas? The mica on the outside will transfer to the hands. You can spritz hairspray on the outside to help seal the color, but you will still get that transfer. After a few uses that color will wash away. I’m just curious – should the fragrance oil be just 0.1 ounce? For 18 ounces of soap? These are gorgeous and your “paint” recipe works perfectly. I use this all the time on my MP projects and just love the results. You are the best!